In the early 1870s, sixty percent of the American population lived on small farms in rural areas. At the time, farmers were producing enough food to sustain their families, but with little excess to profit from. The College of Agriculture at the University of Illinois Urbana-Champaign was founded with the intention of aiding rural farmers, though it also initially struggled with low dairy production (Burlison 1993, p. 22). In the late 1880s, the College of Agriculture began to grow. The Hatch Act of 1887 granted the College $15,000 of federal funds to create an Agricultural Experiment Station and distribute subsequent research findings. In 1888 the Agricultural Experiment Station was formed, and in 1889 the new Dean, Eugene Davenport, organized the College into four departments to create better efficiency and focus (Burlison 1993, p. 22). These departments were agronomy, animal husbandry, dairy husbandry, and horticulture (Nevins 1917, p. 174). The activities of the Agricultural Experiment Station fell into three main categories: research, dissemination of information through bulletins and other correspondence, and instruction (Nevins 1917, p. 329). 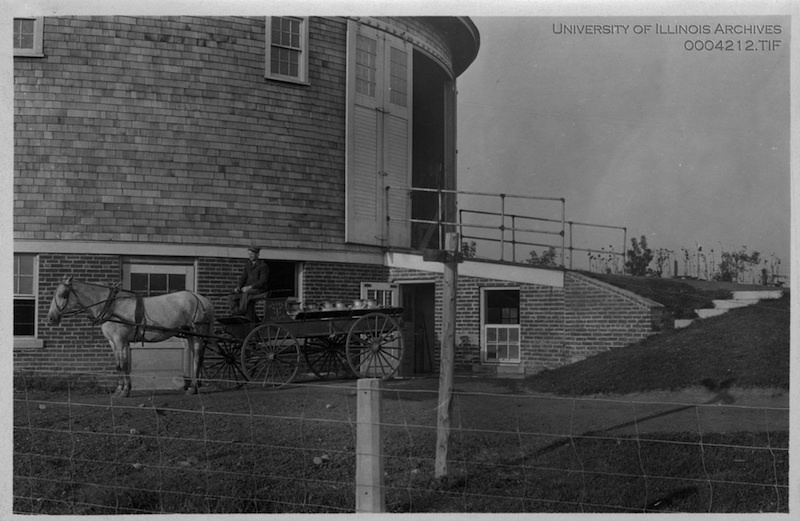 In light of the research focus of the Experiment Station and the newly developed department of dairy husbandry, an experimental dairy farm was established in the University’s south farms to focus on increasing milk productivity and efficiency (Burlison 1993, p. 23). Included in the newly built dairy farm were three round barns. 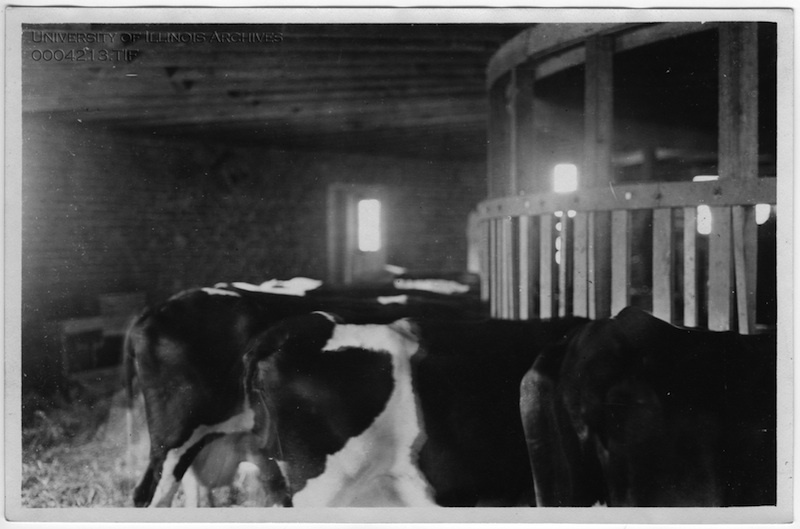 The goal of dairy farming is to produce the most amount of milk at the lowest possible cost, and a major problem that Illinois farmers were facing at the time was that they were “not getting the profits they should from the money and labor invested in the business of producing milk” (Fraser 1909, p. 461). Wilber John Fraser, former Professor of dairy husbandry and Chief of Dairy Husbandry in the Agricultural Experiment Station from approximately 1902-1913, was an early proponent of the round barn design. With his colleague H.C. Crouch, manager of the Experimental Dairy Farm, Fraser led the promotion of round barns in Illinois. 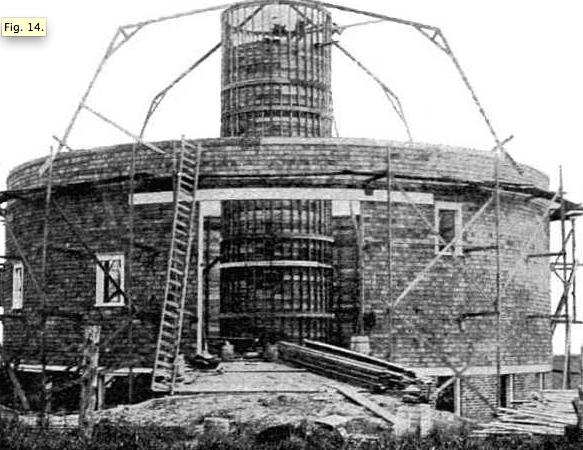 Believing that the construction of round barns was less costly, more convenient, and more efficient than traditional rectangular barns, Fraser gathered widespread attention from Midwestern farmers (Burlison 1993, p. 28). The three round barns were built between 1908 and 1912 in approximately two year increments. Architects Kell & Brand, under the supervision of University Architect James M. White built the three barns at a total cost of $16,200 (James 1920). With each barn built, construction progressively improved. The second barn built was constructed without scaffolding, and the third barn incorporated a wing that allowed for more cattle storage (Burlison 1993, p. 28). 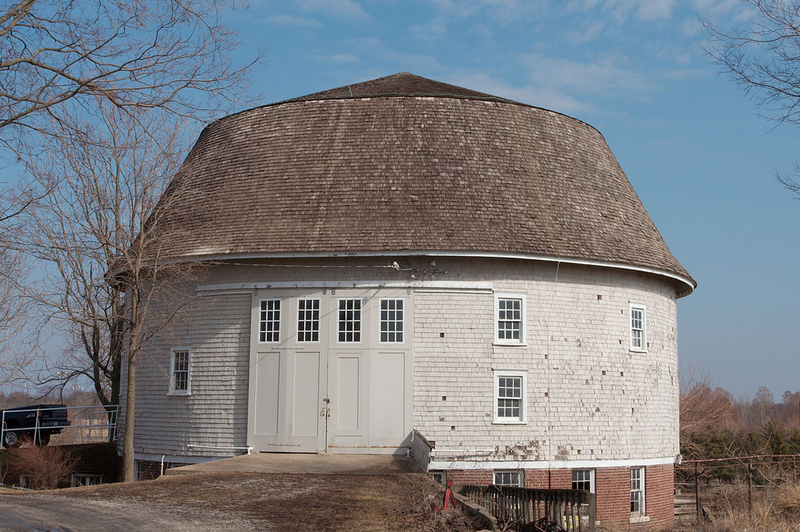 Typically, a round barn would have a silo in the center, livestock on the ground floor, and a large hay loft on the upper floor. Ideally, the barn would be built on a small incline to allow farmers to drive a wagon with hay into a haymow on top on the incline while cattle could be driven from the pasture into the bottom of the barn for milking or storage. Barns one and three at the University of Illinois are located on inclines (Burlison 1993, p. 28). 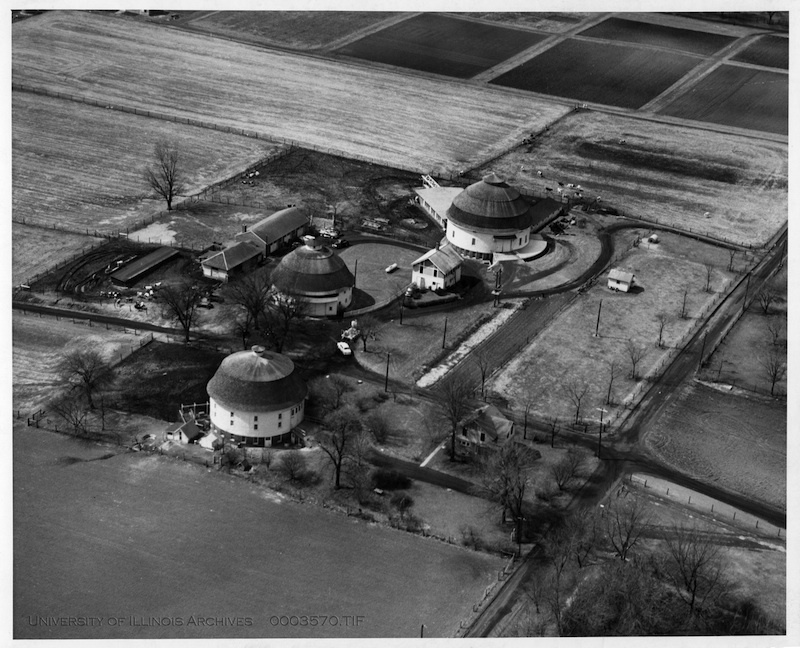 The round shape of the barns allowed for greater wind resistance, important in Midwestern prarielands, and also took advantage of the tensile, instead of flexural strength of lumber to create a stronger building. Green boards were soaked in water for several days to make the wood pliable, and then wrapped horizontally around posts planed in a circle (Burlison 1993, p. 28). Fraser argued that the shape and arrangement of round barns allowed for greater efficiency, and thus decreased labor. Feed and mow for cattle was dropped down an interior chute or center silo to cattle below. Farmers standing in the center of the barn merely forked the hay around the silo where cattle would be positioned in stalls for eating (Burlison 1993, p. 28). The first barn to be built, the Twenty Acre Dairy Barn, was sixty feet in diameter and featured a brick foundation, two oversized stories over a basement, and a center wood silo. It is located on the side of a hill, and slopes to the southeast (Burlison 1993). It cost $3,200 to be built in 1908 (James 1920, p. 81). The second barn, called the Dairy Horse Barn, cost $2,000 to build (James 1920, p. 81). 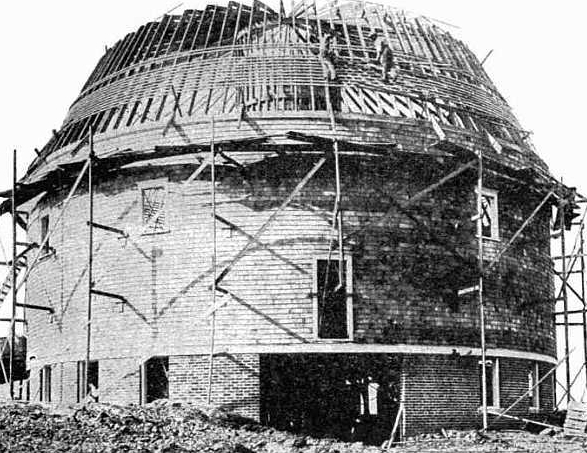 It is also sixty feet in diameter, and features two oversized stories, vertical wood siding, a wood shingle roof, and a concrete foundation. The barn sits on a level section of land, and exposed wall and roof framing can be seen throughout the interior. The original water spigot and concrete trough are just to the south of the northeast entry (Burlison 1993). The third barn, or the Dairy Experiment Barn, was the most costly at $11,000 (James 1920, p. 81). It features an irregular plan, as it has a wing for extra cattle storage. The circular barn area is seventy feet in diameter, and the rectangular wind projects southwest. The barn is two stories in height, has a concrete and brick foundation, square cut wood shingled walls, and a circular triple slope roof with a cupola (Burlison 1993). 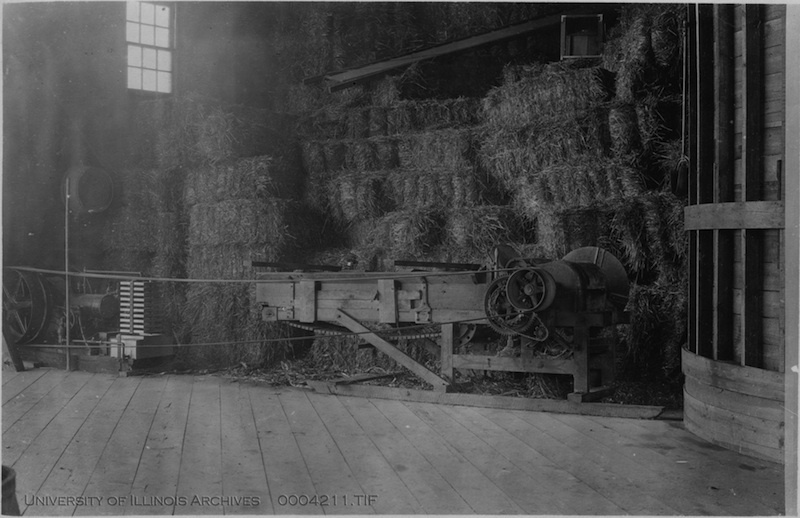 Few round barns were built after World War I when farm mechanization had become more established, and required larger equipment than what the round barn could efficiently hold (UIUC ca. 1994). In Illinois, an additional reason for the round barn’s declining popularity considers that the rich soil found here is better suited to crop production rather than dairy farming (Burlison 1993, p. 30). It has ben estimated that fewer than sixty round barns exist in the United States today (UIUC ca. 1994). The University of Illinois Experimental Dairy Farm was replaced with larger facilities around 1960. However, the three round barns remain in use for small herd dairy experiments. 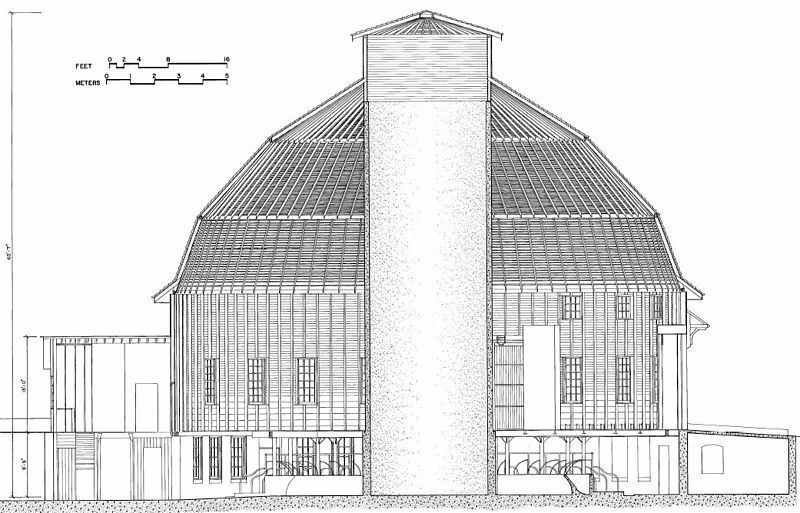 The Twenty Acre Barn provides space for cattle in the lower level and storage in the hay loft, The Dairy Horse Barn stores fertilizer and equipment, and the Dairy Experiment Barn contains hay in the loft and cattle in southwest wing and lower level (Burlison 1993, p. 30). 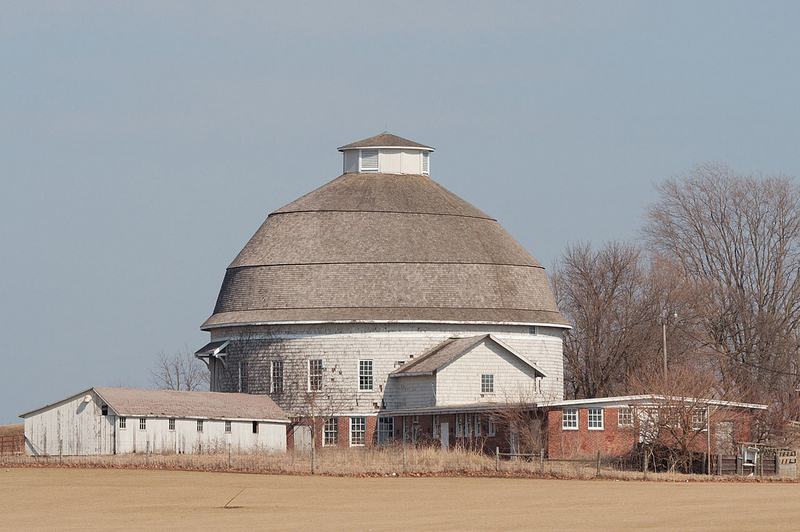 The Round Dairy Barns, as part of the University of Illinois Experimental Dairy Farm Historic District were placed on the National Historic Register in 1994. Barn 1 showing all rafters in place and method of sheathing roof. : Image from Fraser, Wilber J. (1910). "The economy of the round barn." Agricultural Experiment Station Bulletin: 143. Urbana: Agricultural Experiment Station. 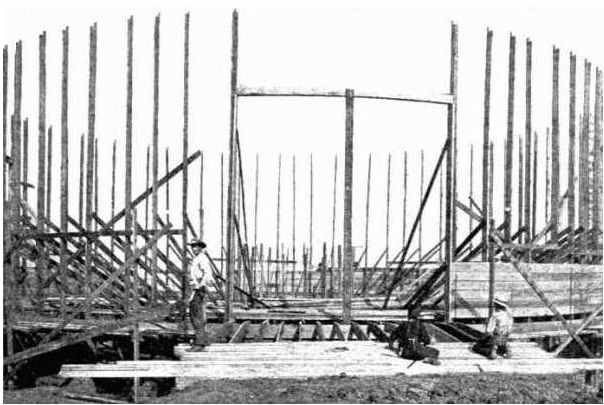 Barn 1 showing temporary bracing to hold studs in place while ship lap ceiling is nailed on: Image from Fraser, Wilber J. (1910). "The economy of the round barn." Agricultural Experiment Station Bulletin: 143. Urbana: Agricultural Experiment Station. Barn 1 showing height and construction of silo, siding completed, and four main rafters in place: Image from Fraser, Wilber J. (1910). "The economy of the round barn." Agricultural Experiment Station Bulletin: 143. Urbana: Agricultural Experiment Station. “Dairy Experimental Round Barns,” ExploreCU, accessed April 20, 2019, https://explorecu.org/items/show/186.